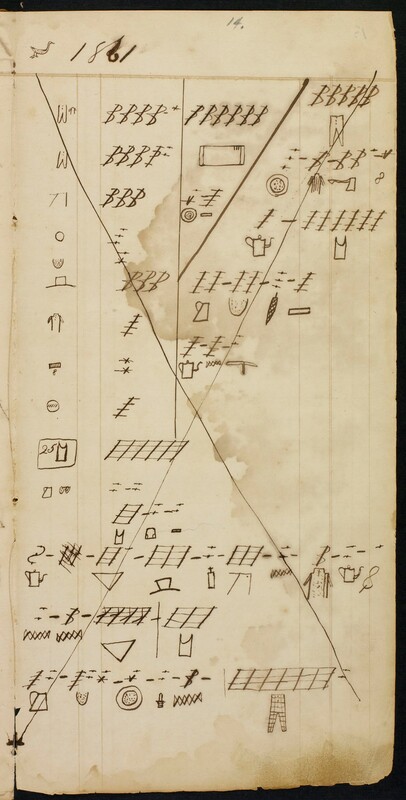 Library and Archives Canada has, in its digital collection, a copy of an account book (featuring a unique pictographic system) that was owned by Ojibwa Chief Michel Dokis. Documents created by Aboriginals using pictographic recording systems are exceptionally rare. Both Michel Dokis and his account book are of outstanding importance, since his contribution and the account book itself highlight the development and use of such a system. Michel Dokis (also known as L’Aigle) was a signatory of the Robinson-Huron Treaty of 1850. Life Chief since 1850, he remained at the head of his community until his death in 1906. Active throughout the second half of the 19th century, he operated several trading posts in the French River area in what is today central-northern Ontario. Michel Dokis was reputedly literate, and fluent in Ojibwa and French. 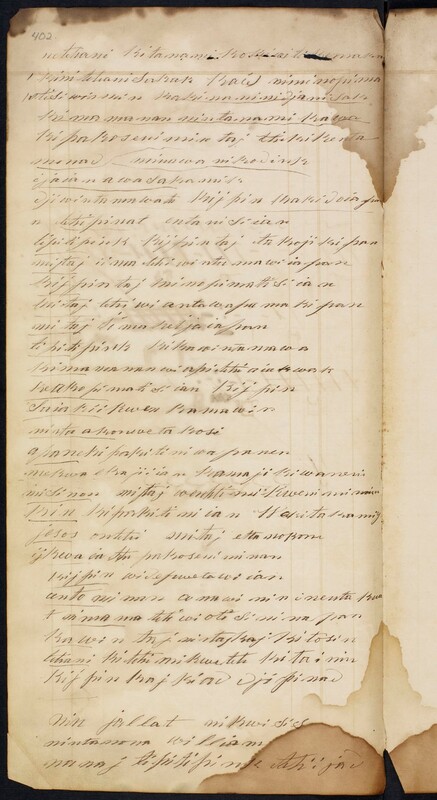 The account book he kept to document his commercial activities reflects the established conventions for a ledger in a double-entry bookkeeping system, each page being devoted to recording transactions with a single individual, or perhaps a family. The upper line indicates the nature and quantity of goods presented for trade while the lower line records the nature and quantity of goods exchanged. Interesting enough, the client is identified in the upper margin through an image indicative of his or her name (beaver, mink, muskrat, otter, turtle, duck, goose, hawk, bow and arrow, acorn, man with hat or flat cap or pipe); some personal names were noted in Ojibwa, English or French. A few dates were recorded in English or French. Occasional explanatory comments were inscribed in Ojibwa, apparently to authorize a payment to a third party or to record the final settlement of the account. 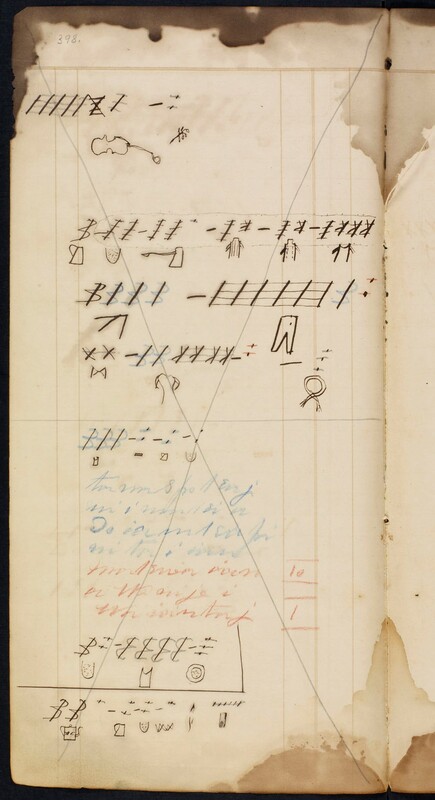 What becomes truly fascinating about this ledger is the fact that entries were made using a unique pictographic system, developed by Michael Dokis, that has yet to be fully deciphered. The symbolic representations for the manufactured goods given out in trade present the fewest challenges to decipherment—notably the violin (page 398). Clothing included different kinds of shirts, trousers and dresses, suspenders, hats, and boots (plain, spotted, striped or plaid), shawls (with or without fringe) and combs. Equipment and tools included scissors, spools of thread and buttons; skeins of twine or rope, candlesticks; knives, hatchets or axes, nails, files, augers, rifles, traps, blankets and tents. Stroke marks (///) over a blanket, trap or other article probably indicated multiples. Deciphering the more abstract images requires a knowledge of the Ojibwa language and of the trading environment within which this recording system was developed. Does the puckered toe of a moccasin stand for the whole item? Do teapots with curved spouts imply tea, while straight-sided pots imply coffee? Does a woman’s dress within a rectangle denote a mirror? Do the dots within a U shape indicate flour, while dots within a double circle indicate gunpowder, or vice versa? What may be characterized as reversed or stylized B’s, C’s and K’s may denote specific furs (based on their Ojibwa names) and cross-hatching may indicate numbers. Decoding these symbols provides a great challenge. Maybe you can unlock the mystery! This entry was posted in Indigenous Resources and tagged Aboriginal, account book, fur trade, Michel Dokis, pictograms, pictographs by Library and Archives Canada Blog. Bookmark the permalink. That book, “The Scholars Primer”, so the original writer claims, it shows you 96 different ways to write this “Ogham” script. And its all little pictograms, and it looks just like L’Aigle’s book! This old Irish language had 20 symbols, or pictograms, or letters. Each of the letters was named after a species of Tree that existed in Ireland at the time the book was written. I will for sure examine this very interesting document, as I’m working on Dokis and other fur traders of french-canadian and native ancestry. I think the Dokis ledger book can’t be understood without keeping in mind is mixed ancestry. His father was the french Canadian Michel Daigle. The name Daigle was changed to D’Aigle, to L’Aigle, to The Eagle, and to Migisi, wich are all the same word for Eagle (in french, english and anishnabe). Almost all the Dokis band were Métis like him too. They created a mixed culture, still a native culture for sure, but different by the contribution of french canadian roots.